Paul Janzen, Sr., goaltender for his hockey team, doesn’t remember much about the third period of his game on February 7, 2014, in Radisson. He battled through the final 18 minutes in an increasingly dizzy and nauseous state. Paul’s team lost the game. He made it back to the dressing room and then the 6’4”, 250-pound goalie collapsed to the floor. He was rushed by ambulance to Royal University Hospital’s Emergency Department where he was resuscitated and stabilized then eventually underwent triple bypass heart surgery. 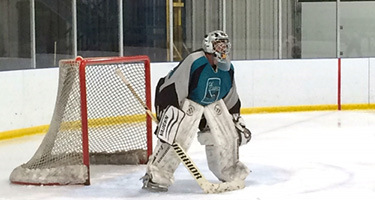 Last winter, “Sasquatch” (as he is affectionately called by his teammates) returned to the ice. While he himself loves to play, even more important to Paul is that he is able to share his love of goalkeeping with his son and grandson. “I am so grateful to be alive today and in a position to help my grandson in becoming the third generation of our family to don goalie gear,” Paul says. To make a donation in support of RUH’s new Adult Emergency Department, please donate online or call Lisa Sands, Senior Development Officer, at 306.655.6477.